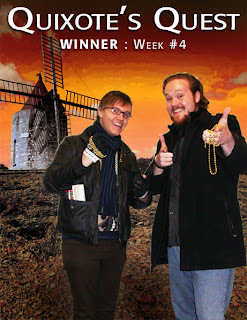 ...Week #4 winner, Dan Miller! A big thank you to the rest of our weekly winners, and to everyone else who participated. We'll do more fun stuff like this in the future, so make sure you "like" us on Facebook, follow us on Twitter, and keep up with this blog for the latest on what we're up to. 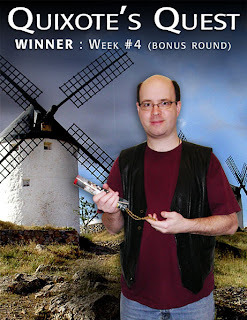 And have a look at the photos below for a complete recap of the "Quixote's Quest" adventure! Our first week of hunting kicked off with this clue: "Quixote can find a vicious giant even on the high sierra of Seattle’s Mt. Baker neighborhood." 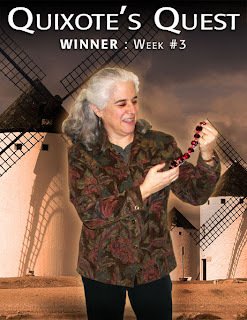 It was all Safia J. and her husband needed to figure out that the necklace was hidden at the windmill at Bradner Gardens Park, in Seattle’s Mt. Baker neighborhood. That afternoon, the couple picked up their child early from daycare so they could zip over to the park and claim their prize. And it's a good thing they hurried. 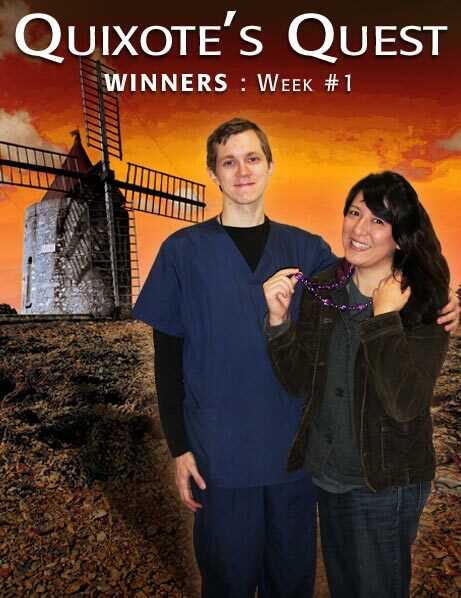 Just a few minutes later, Paula J. showed up, narrowly missing out on the prize. 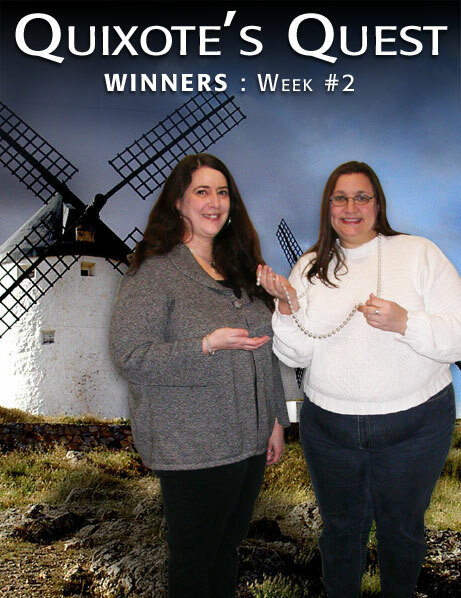 But Paula J. and her friend fared a lot better during the Week #2 hunt, where they managed to crack the three confusing clues we posted. Eventually, the clues led them to the 4th floor of the central branch of the Seattle Public Library, where they found the hidden necklace. Moral of the story: Perseverance pays off! ...but we still couldn't outwit Dan M. and Billy F. We decided to end "Quixote's Quest" with two chances to win, and Dan and Billy (who are friends and music majors at the University of Washington) took that as a personal challenge. "I thought we were going to help each other out with the hunt, but Billy called me and said, 'I know where the first one is,'" said Dan. "And I said, 'Whatever, man, I know where the second one is!'" From there, it was a race to see who could find a necklace first, with Billy winning thanks to a class schedule that let him head all the way up to the windmill at Marymoor Park before Dan could walk the few steps to the University Village Barnes & Noble. We just weren't ready to let the fun end, so we decided to include a bonus round during that final 4th week. This time, we hunkered down and did our best to think of really obscure clues--and a really obscure hiding spot, which ended up being at the north end of Discovery Park, where we taped the necklace to the bottom of of a wooden viewpoint that looks out onto the water. Still, it only took two clues for Scott H. to figure it out. As it turns out, Scott grew up in the area and knows the park like the back of his hand.